Stanley Matthews, one of Britain’s greatest footballing heroes, was ahead of his time. While most other players were still wearing, thick, heavy football boots well into the second half of the 20th century, Matthews had adopted the so-called ‘Continental’ style as early as 1953, having first seen them in action at the world cup in Brazil three years earlier. The only footballer to have been knighted while still playing, the ‘Wizard of the Dribble’ even helped produce a pair of boots in association with the Co-op – who sponsored him for £20 a week – with a design that was heralded as lighter and more flexible than anything that had gone before. 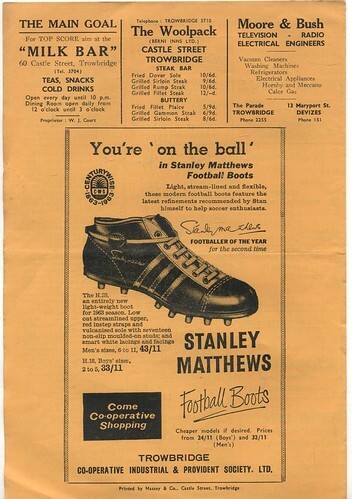 In the early 1960s, his boots from 1953’s so-called ‘Matthews’ F.A. Cup Final were auctioned for £11. In 2010, another pair said to have been worn on the same occasion sold for £38,400 – along with a programme signed by all the players – although there was some doubt about their provenance. The leather-soled size sevens with six nailed-in studs – original retail price 20 shillings – were said to still bear traces of the Wembley turf. In the early days of purpose-made sporting gear, football players would buy their boots a size too small…and then stand in a hot bath to allow them to expand and mould to the shape of their foot. The boots had to dry slowly and naturally – never in front of the fire – and finally be well-greased in dubbin. Coal miner Jackie Milburn – uncle of Bobby and Jackie Charlton and one of the famous footballing Milburn family – did things differently. He wore his new boots down the pit where the wet conditions helped to break them in, and continued this strategy even after becoming a part-time professional. He famously rejected a pair of new lightweight boots given to him by the England management in 1950. 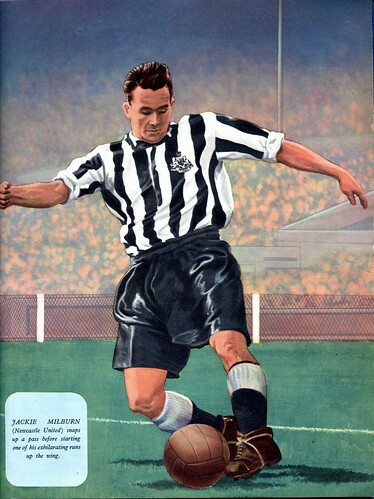 ‘Wor’ Jackie – ‘Our Jackie’ as he was known throughout his Newcastle career – was inducted into the English Football Hall of Fame in 2006. Football boots are, strictly speaking, not boots at all, as they do not cover the ankle. But somehow, the term football shoes doesn’t quite have the same ring to it! Now at the heart of a multi-national global industry, football boots have come a long way since metal tacks were hammered into the soles of everyday workboots to provide grip on grass surfaces. The first-ever football-specific boot was designed in the 19th century, made of thick, heavy leather which weighed a hefty half a kilo – and could double in weight when wet. Gola, Hummel and Valsport became household names in the first half of the 20th century. But it was not until 1954 that Adi Dassler – he of Adidas fame – introduced screw-in studs which revolutionised the game…although brother Rudolf, the founder of rivals Puma, spent years vociferously disputing the claim.